Growing up I always loved writing. I had dreams to someday be an author and I have vivid memories of myself sitting in front of our old school Apple computer making up creative stories. I remember when my friend, Rachael, started blogging and I thought it was SUCH a great way to keep track of all of my experiences when I became pregnant with my first baby in August, 2008. What started as a personal journal of sorts that only a handful of people even knew about, let alone read, has really evolved into so much more. While the blog has grown and changed over the years, I always keep my main purpose for blogging the same as it’s always been: a gift for my children to someday have so they can remember all of our family moments together. Along with our personal moments I have loved this avenue for sharing my perspective on parenting and on life as a mom. I remember feeling very lonely when Kye was born and it means the WORLD to me when readers reach out and let me know how my little corner of the world has helped them feel less alone or has given them guidance in an area where they needed it. I also love that blogging has connected me with people. Readers who I may never meet and ones who have become in-life real best friends. I know there is a lot of negative when it comes to social media and the online community but the negative parts I’ve experienced from putting myself out here like I have cannot come CLOSE to comparing to the incredible blessings I’ve received. Prayers when we’ve needed them most, support when I’ve struggled, advice when I’ve needed it, and encouraging reminders that sharing our lives on this platform has truly helped others along their paths. A decade worth of blogging is something worth CELEBRATING. I’ve thought on this for a long time and decided that I really wanted to do something BIG to thank all of you for being here with me over the last 10 years of my life. A thank you for supporting me, growing up with me, and sharing your lives with me too. While my journey of parenting has always been the main focus of the blog, my enjoyment of visiting Disney World has become a large focus as well and is something I LOVE. Zach and I recently purchased a home only a few miles from Disney World and decided we wanted to really use our home to be able to bless a family with a stay! You can learn all the details about our Disney Vacation Home here! The house is located 3 miles from the Disney World theme parks in Emerald Island Resort but is also close to a TON of other stuff to do as well. So even if you’re not looking to visit Disney…it’s still a very convenient place to stay! We will be covering ALL costs associated with the stay, including pool heat if desired. If the winner would like to add on additional days we will offer those at a discounted rate as well. Travel must take place in 2019. Booking is based on availability and black out dates for holiday seasons do apply. Can’t make the trip to use the house? 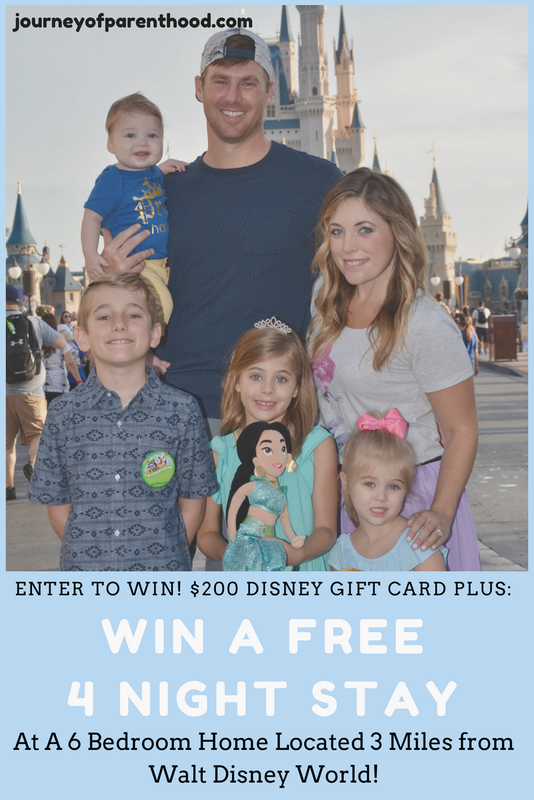 The $200 Disney Gift Cards will still be shipped to the winner and can be substituted for Amazon or Target if desired. This giveaway is open to US Residents only and you must be over 18 years old to enter. The giveaway ends on Monday August 13th at 11:59 EST. A winner will be chosen by random and contacted via email! I am SO excited about this giveaway. Our family LOVES Disney and when we purchased this home we have really made it a goal to make it affordable to families in hopes of helping people cut costs to be able to visit Disney. It makes me so happy to think about a sweet family getting to use the house at no cost and having that spending money to make their trip extra special! Want to go ahead and secure your travel plans? We offer a discount to friends, family and blog readers who want to stay at Hidden Mickey Hideaway (yes, we named our vacation rental house ha!). You can find out info on the home, date availability and our discount on the rates here! Words cannot begin to describe just how much all of you mean to me. That may sound silly but it’s so true. Blogging has become a huge part of my life and a huge source of joy too. Thank you to each and every one of you! I am so excited to see what the next decade brings. There are some exciting changes in the works and I look forward to continuing to grow together! Wow! What a giveaway! I have been interested in watching your family grow from afar. We have four kiddos with our youngest being our foster daughter. The transition from 3 to 4 kids has kicked my tail! It's nice to hear I'm not alone in the good and hard moments.